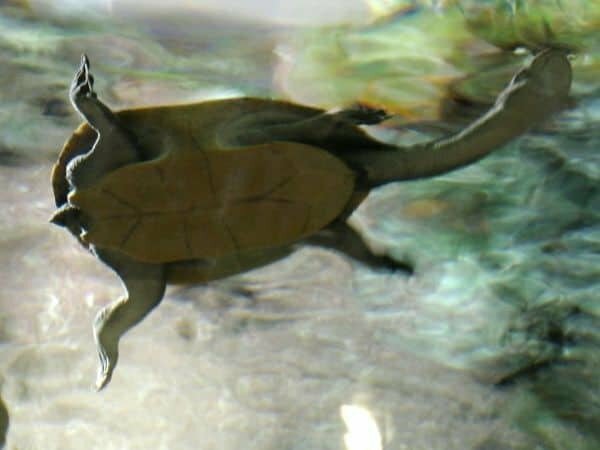 The Snake necked turtle is a common name attributed to many species of turtles with their strikingly long necks inspiring their name and popularity. Their biological classification is complex and evolving with new discoveries and methods. The way they withdraw their long necks by bending it sideways in front of their front legs, is a unique differentiator of side necked turtles (Pleurodira). By contrast, the normal turtles as you know (Cryptodira) pull their shorter neck and head completely into their shell. Turtles are a widespread and ancient species that shared the world with dinosaurs over 200 million years ago and now are still with us. Today, the snake necked turtle is found in the wild near South America, Australia, New Guinea, and Southeast Asia. Keeping them in captivity is always a big personal and professional responsibility and in all the excitement, you need to understand what caring for these creatures requires. Given the right weather conditions snake necked turtles can be kept outdoors in a well-protected enclosure. Some of the essentials in their care are controlled temperatures, clean freshwater and plenty of dry spaces for them to bask and rest. Understanding this will help you plan a roadmap for the tortoises including key decisions to induce artificial hibernation as well as their breeding and overall safety. Most of the snake necked species are generally carnivorous and enjoy eating while in water. Hatchlings need daily feeding while adults feed two or three times a week. It is best to have a designated area for feeding in the indoor or outdoor enclosure. Doing this will help get them used to a feeding pattern and will allow you to clean up the food scraps. Fresh food is the most preferred choice and snake necked turtles enjoy a variety of diets shrimp, fish, worms and small insects. It is easy to over feed your pets, so tracking their weight is a good idea. Outdoor enclosures should be large (space permitting) in order to recreate their natural habitat. Make sure to include a basking space as well as water and that it is shaded from direct sunlight. Key areas to start planning and building your turtle’s habitat include protection from external predators. A fence along with a cover if possible would be ideal. Completely emptying and refilling water can be disruptive. Instead, a reliable water filtration system that constantly cleans water would be preferred. An indoor setup needs specialized UV light and ventilation equipment to give snake necked turtles the best chance for survival and healthy development. These turtles can live for more than 30 years, therefore you should make sure you can commit to them. In nature these turtles predators are usually thinks like possums, racoons, other large rodents and birds. 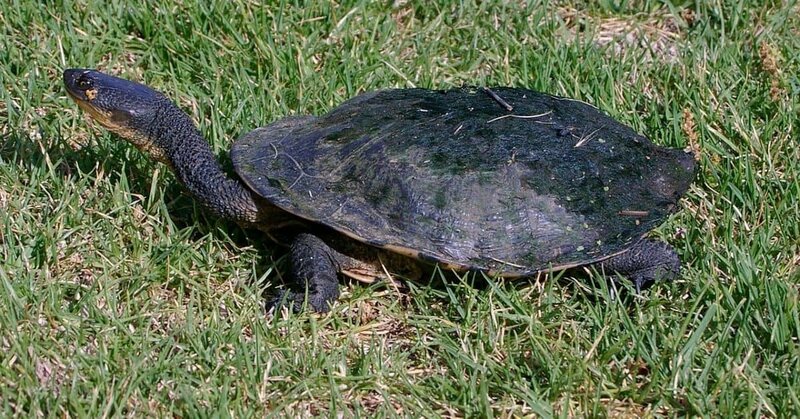 Turtles like the Parker’s Snake-necked Turtle (Chelodina parkeri) and the Brazilian Snake-necked Turtle (Hydromedusa maximiliani) are listed as vulnerable in the IUCN Red List of Threatened Species. There are several others on the same list including the Pritchard’s Snake-necked Turtle (Chelodina pritchardi), and the Roti Snake-necked Turtle (Chelodina mccordi). CITIES (The Convention on International Trade in Endangered Species of Wild Fauna and Flora) also lists out endangered snake necked turtle species in their appendices. Snake necked turtles mostly dig into moist land to lay their eggs, though some build nests for their eggs in the water itself. Hatchlings are then left to develop and survive on their own. If you pick up an egg before it has hatched you will need to get an artificial incubator. The number of eggs, survival rates and reproductive seasonality vary among species and consulting a professional breeder or vet is highly recommended. So, over to you! Do you own a Snake necked turtle? Do you have any tips that we might of missed? Let us know in the comments below!